In this picture a stud has been cut and removed by an electrical contractor compromising structural integrity. An easy fix would be to add a stud next to where it was removed. Minimal removal of structure for installation of utilities is desirable. 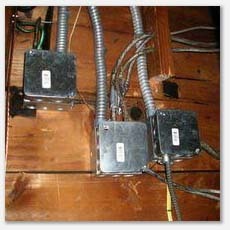 It is amazing what a electrician, plumber or HVAC contractors do to a framer's work! See more examples of structural problems caused by cut framing components.